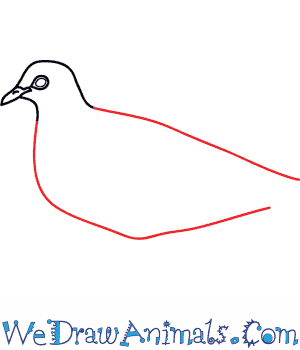 In this quick tutorial you'll learn how to draw a Mourning Dove in 9 easy steps - great for kids and novice artists. 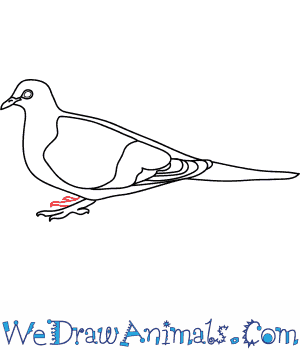 At the bottom you can read some interesting facts about the Mourning Dove. 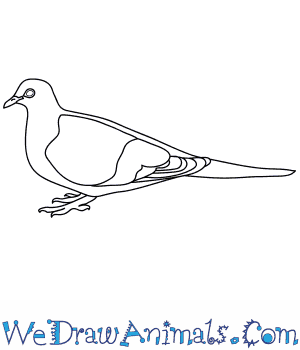 Step 1: To begin drawing your Mourning Dove start with the head. 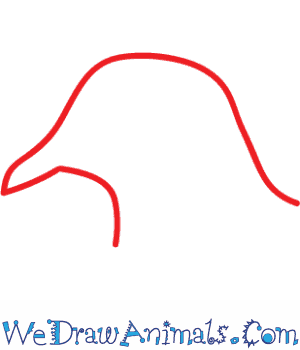 Draw the head with an arced top and a triangle shape for the beak. 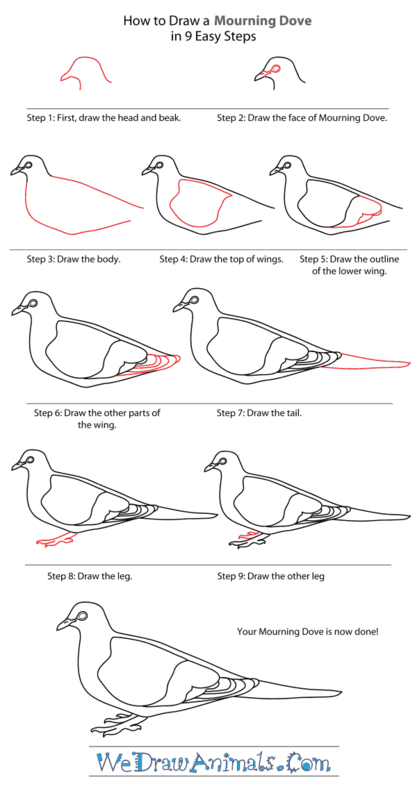 Step 2: Now you will need to draw the face of the dove. Start by drawing a circle with a smaller circle inside for the eye. 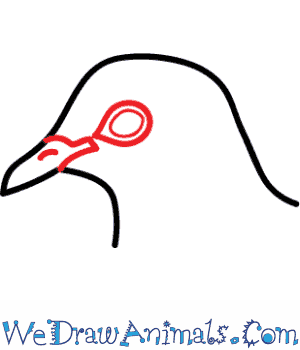 Section of the beak with a straight line. Step 3: The next step is to draw the body. Draw angled line coming out of the top of the head and another line coming down from the front of the head. Step 4: Next draw the top of the wing by drawing an irregular square shape like the one shown above. 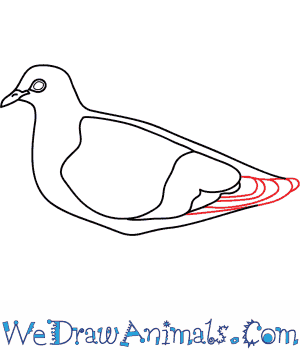 Step 5: Now you will need to draw the outline of the lower wing. 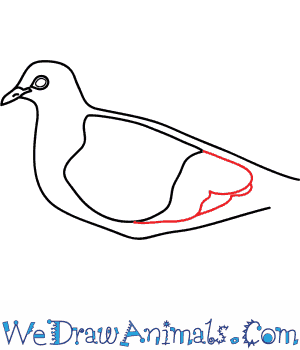 Draw the lower part of the wing coming out from the first piece as shown above. Step 6: To draw the other parts of the wing draw increasingly longer semi circles inside each other until it extends past the body. Step 7: Now you will want to draw the tail. 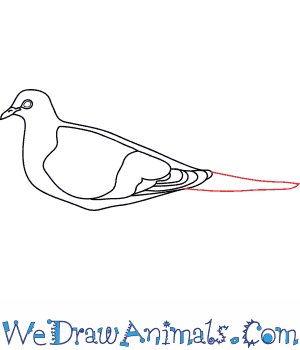 To draw the tail draw a long round line that starts at the end of the body. Step 8: For the next step, you will need to draw the leg. Draw the leg with three elongated semi circles for toes. Step 9: The final step is to draw the other leg. This can be done by drawing two toes showing behind the first leg. 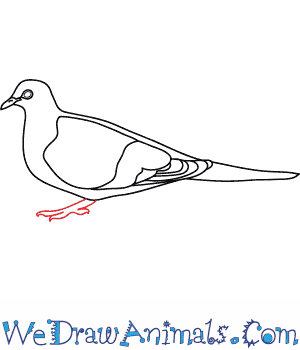 You have now completed your Mourning Dove. The Mourning Dove is a member of the bird family and the scientific term for them is Zenaida macroura. Another name for this species is the Turtle Dove, American Mourning Dove, Rain Dove, Carolina Pigeon, and Carolina Turtledove. This animal is one of the most abundant birds in North America. The animal was first documented in 1758. This species is 1 foot in length. They can fly up to 55 miles per hour. The bird weighs about 3/4 of a pound. They live in a range of over 4 million square miles. The bird can complete the baby food routine in only 11 days. They require over 99 percent of their adult diet to consist of seeds. The creature can lay up to 2 eggs. The wings of this species make a whistling sound when flying. This type of bird maintains the same mate for the rest of their life. Mother doves are capable of having about half a dozen pregnancies in a year. For the first week or so, the babies consume milk. There are not many of these creatures, but they’re the least concern for a possibility of extinction.